In January 2002,HP celebrated the 60th anniversary of Bill Hewlett's patent for the HP 200A audio oscillator. On exactly the same day in history that a Pan American Airlines Clipper completed the first commercial air circumnavigation of the globe, the United States Patent Office conferred the rights to the Variable Frequency Oscillation Generator to William R. Hewlett. The year was 1942 and Bill was 28 years old. Looking back at the seminal stages of any innovation is challenging. It isn't easy to throw the brain into mental reverse and imagine a time when the term "electronics" had not yet been coined and circulated among the masses of the realm; a time when radio engineering, as it was called, applied mostly to entertainment mediums such as talking pictures and phonographs. But a 60-year flashback into history sheds light on the brilliant inception of the technological storm that blew through so much of the 20th century. 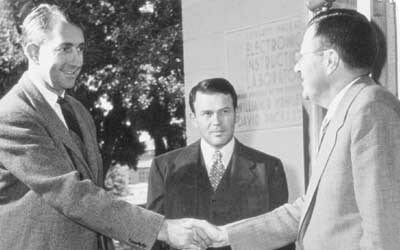 1952Dave and Bill met with their Stanford University engineering school mentor, Fred Terman, when they donated a new wing to Stanford's Electronics Research Laboratory. Bill's idea grew out of a graduate seminar at Stanford University during the late 1930s. His professor and mentor, Frederick E. Terman, decided to devote an entire semester to exploring the use of negative feedback in fixed-frequency audio oscillators. He was interested in this relatively new technique, thinking it had great potential in the budding field of electrical engineering. The audio-frequency oscillators available at the time were complex, expensive, unstable and prone to distortion. Terman ran across a General Radio Company article describing how one of its engineers produced oscillations by the application of negative feedback. It piqued his curiosity. He thought the spot-frequency oscillator was quite limited in its usefulness but suggested to Bill that by introducing a variable-broadcast tuning condenser in place of the fixed condensers, it might improve performance and develop into something practical. Bill was at Stanford doing further graduate work after receiving his masters at MIT. In order to complete his advanced engineering degree, he needed to write a thesis. Terman's suggestion became the jumping-off point for completing his graduate work and the seed of a future no one could foresee. Bill went to work on the project with his usual enthusiastic style. Terman noted in later years that Bill's greatest satisfaction seemed to come from figuring out how things worked. If he hit upon something he didn't understand, he'd pore over diagrams until he knew what every component was supposed to do. In the late 1930s, variable-frequency oscillators were not new. They'd been around since Michael Pupin invented the tunable oscillator in 1893. In 1913, Alexander Meissner and others induced oscillations in vacuum tube amplifiers utilizing a regenerative (positive feedback) network. Stephen Black of Bell Telephone Laboratories designed a degenerative (negative feedback) network that reduced distortion in audio amplifiers in 1927. Top view of the inside of the HP 200A audio oscillator. After applying his restless intellect to the project, Bill combined these principles and came up with something that was elegant, simple and new. 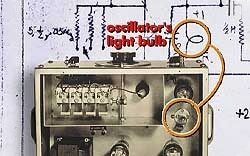 He inserted a light bulb in a Wien bridge oscillator circuit. With the introduction of an incandescent lamp into the design, Bill solved the problem of regulating output of the circuit without causing distortion. He had simplified the circuit and improved its performance. It was a good start on the road to perfecting tools engineers could use to make precisely accurate measurements. Today, the original prototype resistance-capacity oscillator Bill built as a graduate student resides in the HP Archives. At about the same time, Terman received a $1,000 (US) gift for use in researcha princely sum in the midst of the Great Depression. He approached Bill and suggested he contact Bill's good friend and former graduate student, Dave Packard, who was working for General Electric (GE) in Schenectady, New York. The idea was that if Dave, who had vacuum tube experience, would take a leave of absence from GE to work on the project, they could pay him $55 a month for nine months, and still have $500 left over for expenses. The two younger men had talked about going into business together many times so it seemed to Bill their opportunity had arrived. Whatever Bill said in his letter worked. Dave took a leave from GE and returned to Stanford. He worked half time on the tube project with Bill and enrolled in formal courses the other half. He never returned to GE. It was soon clear that they were on to a partnership that had the potential to soar. 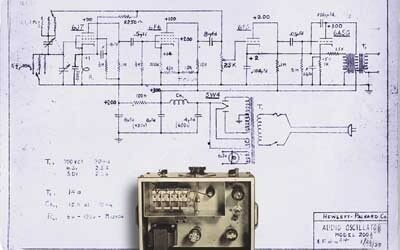 Bill's technical drawing of the HP 200A audio oscillator dated January 26, 1939. Bill and Dave started their business together and named it with the toss of a coin. They built the first Hewlett-Packard oscillators in Dave's rented garage on Addison Avenue in Palo Alto, California. Their initial product was the 200A audio oscillator; It sold for $54.40. Similar equipment built by competitors cost between $200 and $600, a whopping price difference that generated a buzz very quickly. The company's first big sale was an order of eight model 200B audio oscillators to the Walt Disney Company. Disney engineers used them to test the channels, recording equipment and speaker systems for its new "Fantasound" sound system. The proceeds from those early sales funded more work that improved each successive model. 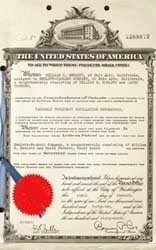 Patent number 2,268,872 was issued on January 6, 1942. In 1939, Bill hired a San Francisco attorney to file for a patent on the Variable Speed Oscillation Generator. Once the patent was granted in 1942, Bill promptly assigned it "to Hewlett-Packard Company of Palo Alto, California a co-partnership consisting of William R. Hewlett and David Packard." Egon Loebner, former HP Labs counselor for Science and Technology, referred once to Bill's patent as "a sort of techno-economic birth certificate." The bright idea behind the 200A, was the first born in a long line of innovative sibling products. The patent was the first of 13 granted to Bill over the course of his lifetime. He was inducted into the Inventors Hall of Fame in 1992. Patent No. 2,268,872 launched a fledgling company and spawned the 200-series oscillator products featuring broader ranges, higher outputs and lower distortion than previous models. It set in motion a history the HP family is still in the midst of living. The 200A was produced until 1953. Its replacement, the 200CD, debuted in 1952 and was only declared obsolete after an astounding 33 years in productionpossibly one of the longest active lifetimes for any electronic product. Happy diamond anniversary to a real jewel of a good idea.